I couldn’t resist it. 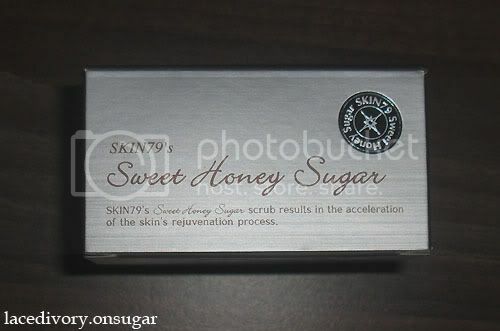 I bought Skin79’s Sweet Honey Sugar Scrub off ebay after reading great reviews about it. It came in the mail about a week or so after. I couldn’t use it when it arrived because of my rash so I had to wait for about another week or so. And after I finally got down to using it, I must say I’m so in love! This scrub contains brown sugar and honey and helps to remove blackheads, shrink and tighten large pores and absorb excess oils. 1) It didn’t break me out. 2) It comes with a tiny spatula so you don’t have to dig your fingers in and contaminate the rest of the tub. One spatula is enough for one usage. 3) It smells soooooooooooo good! Exactly like sugar and honey put together! 4) I like the scrub bits. They are bigger than what you normally find in facial exfoliators but they feel nice. 5) My skin feels sooooooo smooth after scrubbing! 6) The packaging is pretty too. Bonus point. 1) Nothing. I’m in love with everything about it. 1) Can’t it be sold in Europe??? LOL. I really recommend this scrub to everyone, especially those with sensitive skin! It contains lots of oils (like Olive and Sunflower), Shea Butter and has no alcohol (but there is paraben)! You can be sure I’ll get another tub once this one finishes. Sucrose, Mineral Oil, PEG-7 Glyceryl Cocoate, Glycerin, Olea Europaea (Olive) Fruit Oil, Butylene Glycol, Isododecane, Polysorbate 20, Trihydroxystearin, Helianthus Annus (Sunflower) Seed Oil, Ceresin, Sorbitan Sesquioleate, Macadamia Ternifolia Seed Oil, Disteardimonium Hectorite, Honey Extract, Theobroma Cacao (Cocoa) Seed Extract, Tocopheryl Acetate, Propylparaben, Propylene Carbonate, Simmondsia Chinensis (Jojoba) Seed Oil, Rosa Canina Fruit Oil, Oryza Sativa (Rice) Extract, BHT, Fragrance, Butyrospermum Parkii (Shea Butter) Lavandula Angustifolia (Lavender) Flower/Leaf/Stem Extract, Chamomilla Recutita (Matricaria) Flower Extract and Calendula Officinalis Flower Extract. 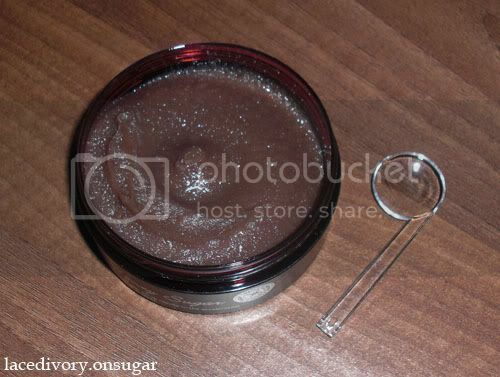 Review: Skin79’s Sweet Honey Sugar Face Scrub was last modified: October 16th, 2010 by Roxanne C.
The Make-up Blogette’s Giveaway: What’s in My Makeup Bag?